Dozens of Mississippi family physicians, residents and medical students turned out for MAFP Capitol Day 2018, making important contacts with state legislators. 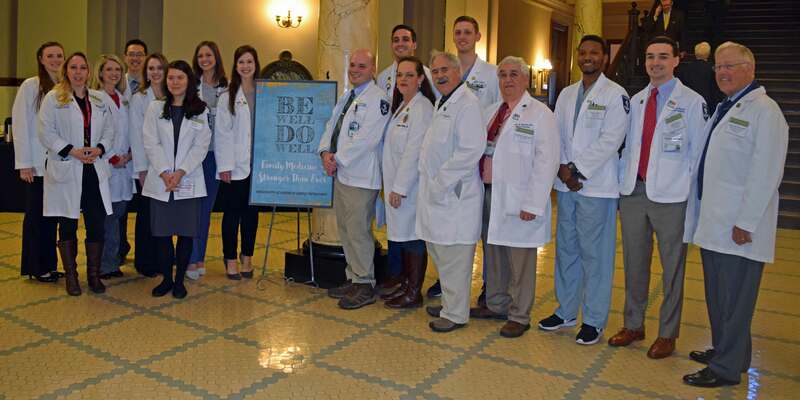 MAFP Capitol Day began with a buffet breakfast in the Capitol Rotunda, where doctors greeted legislators, who then had the opportunity to be screened for cholesterol, glucose and blood pressure from MEA Medical Clinics. After a tour of the Capitol building, including the on-site medical clinic, attendees briefly sat in the Gallery to see the Senate at work, and were formally recognized from the floor by Sen. Terry Burton of Newton. Some physicians attended committee meetings to see debates first-hand. The group also heard briefings on current issues from Ashley Thompson, MAFP Advocacy Director, and Eric Waskowicz of AAFP in Washington, D.C.
Mid-morning, MAFP furnished desserts and coffee to more than 75 legislators and gave them Mississippi-made coffee mugs from Peter’s Pottery. Caricature artist Ricky Nobile was on hand to draw legislators on the spot. Here, attendees had a chance to meet their local leaders, some for the first time. Special guests spoke to MAFP during a members-only lunch. State Sen. Chris McDaniel and state Rep. David Baria, who are challenging U.S. Senator Roger Wicker for his seat in November, outlined their platforms for the group. State Rep. Michael Evans and state Sen. Sally Doty, both running to represent Mississippi’s Third Congressional District this November, also campaigned. Family physicians also welcomed Dr. Mary Currier, State Health Officer, Miss. Department of Health, as a special guest during lunch.